De Quervain’s tendinitis is the irritation and pain associated with thickening of the sheath surrounding two tendons on the radial (thumb) side of the wrist. 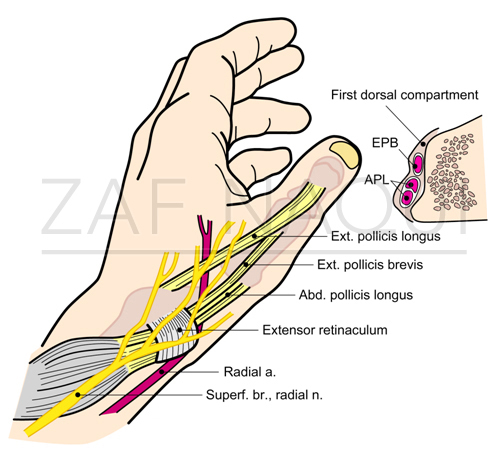 These two tendons abductor pollicis brevis (APB) and extensor pollicis brevis (EPB) connect muscles located in the forearm to the thumb, and power sideward movements of the thumb. The tendons are usually surrounded by a lubricating (synovial) sheath, which allows smooth, sideward movement of the thumb. When this sheath is thickened, it irritates the smooth tendon movements causing pain particularly when holding objects tightly and twisting the wrist. It is also known as de Quervain disease, de Quervain’s tenosynovitis or de Quervain’s stenosing tenosynovitis. It can affect all ages but is commonly seen in middle-aged women. New mothers, in particular, may develop the condition at 4-6 weeks after birth. In other patients it can be triggered by repetitive grasping movements, injuries to the wrist and inflammatory conditions such as Rheumatoid disease. Patients mainly experience pain with movement of the wrist, particularly when trying to firmly grip objects or twist their wrist. The pain is located at the thumb side of the wrist overlying the two tendons. Swelling may also be noted. Some patients report a catching sensation when attempting to move the thumb. The diagnosis is usually made during a consultation with a history and examination of your hand. Avoiding activities that cause the pain, using a splint and taking anti-inflammatory medications may help improve symptoms. Steroid injections into the tendon sheath act to reduce any inflammation in the tendon sheath and can have a good result in patients with early stages of the disease. If symptoms fail to improve or worsen then surgical treatment is considered. The aim of surgery is to relieve the pressure on the tendons by opening the tendon sheath with a small incision. This gives more space for the tendons to move and stop them catching on the sheath. Mr. Naqui performs De Quervain’s disease surgery at a number of hospitals around Manchester (see Hospitals page). The surgery usually lasts 30 minutes and is a day case procedure. It can be performed under local, regional or general anaesthetic (see FAQs page). The surgical scar is usually straight and 2 to 3cm long. Fine stitches are usually used to close the wound. A dressing will be placed over the wound, which is usually reduced within 5 days. The stitches will be removed at 10-14 days after the operation either at your GP or back at the hand clinic. Mr. Naqui and the hand therapist will provide you with specific wrist and thumb exercises to perform after surgery but early movements are encouraged. For office workers around 1-2 weeks and for manual workers approximately 4-6 weeks off work is sufficient. Driving can safely be resumed at 1-2 weeks. Mr. Naqui will discuss with you regarding return to sports depending upon your particular sport. The complication rates are low but include infection, superficial nerve injury, persistent pain and recurrence of the disease.